Ethics is not just a matter of opinion. 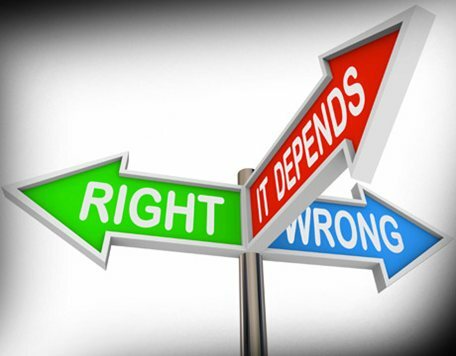 Ethical issues can be analyzed in an objective and rational manner. It is not enough, however, to give arguments that sound convincing to you. Different arguments sound convincing to different people. We must learn to deduce conclusions from a few basic principles of reasoning that we can all accept, much as one does in mathematics. 1. Generalization principle. The reasons for your action should be consistent with the assumption that everyone with the same reasons acts the same way. 2. Utilitarian principle. You should choose an action that maximizes the net expected utility for all affected, where utility is the ultimate end toward which all of your actions are means. 3. Virtue ethics. You should choose an action that is consistent with the virtues, defined as qualities that are essential to our humanity. 4. Respect for autonomy. Roughly speaking, you should not interfere with freely chosen actions of others that satisfy principles 1-3. These sound like the Kantian, consequentialist, and Aristotelian ethics often taught in courses, but the traditional material is not rigorous or coherent enough to resolve real-world issues. In the following set of 30-minute videos, I try to show how these principles can be made precise enough to provide a basis for ethical reasoning in real life. I made the videos for business students and faculty, but most of the material deals with ethical analysis in general. (The videos are recent updates of the original 2012 version.) If you don’t have time to watch the videos, read the transcripts. Business Ethics Course, Session 1: Why Ethics? Transcript with slides. Business Ethics Course, Session 2: Rational choice I. Transcript with slides. Business Ethics Course, Session 3: Rational choice II. Transcript with slides. Business Ethics Course, Session 4: Daily life case studies. Transcript with slides. Business Ethics Course, Session 5: Business case studies I. Transcript with slides. Business Ethics Course, Session 6: Business case studies II. Transcript with slides. Or you can check out my textbook, Business Ethics as Rational Choice. I have applied this type of analysis to hundreds of dilemmas. The application is not always easy and may require close reasoning. However, the analysis usually yields an answer on which reasonable people who accept the underlying principles can agree. Ethics doesn’t judge whether you are a good person or bad person. It provides a framework in which we can agree on the ground rules for how to live together. Ethics isn’t designed to solve all of your dilemmas or tell you the meaning of life. It only addresses how we can get along with each other. Thanks for sharing superb information. Your web site is so cool. I am impressed by the details that you have on this site. It reveals how nicely you understand this subject. Bookmarked this website page, will come back for more articles. You, my pal, ROCK! I found just the info I already searched all over the place and just could not come across. What a perfect website. The design for your blog is a tad off in Epiphany. Even So I like your weblog. I may need to use a normal web browser just to enjoy it.